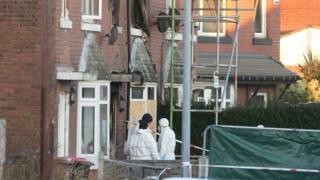 Two people charged with murder over the deaths of three children in a house fire in Salford have appeared in court. Zak Bolland, 23, and Courtney Brierley, 20, both of Worsley, Salford were also charged with arson and four counts of attempted murder. They were remanded in custody until their next appearance. Demi Pearson, 14, Brandon, eight, and Lacie, seven, died in the blaze on Monday. Their mother Michelle and a three-year-old remain in hospital. Mr Bolland, of Blackleach Drive, and Ms Brierley, of Worsley Avenue, did not apply for bail and are listed to appear at Manchester Crown Court on Thursday. Two men, aged 19 and 20, arrested on suspicion of murder have been released on police bail. A 24-year-old man arrested on suspicion of assisting an offender has also been bailed. The three-year-old, who cannot be named due to their age, is in a critical condition in hospital following the fire at a property in Walkden, which broke out at about 05:00 GMT. Ms Pearson, 35, has been heavily sedated and has not yet been told about the deaths of her children. Two 16-year-olds - who also can not be named for legal reasons - in the house at the time of the blaze managed to escape. Image caption The head teacher at the school Demi attended said she was a "really good kid"